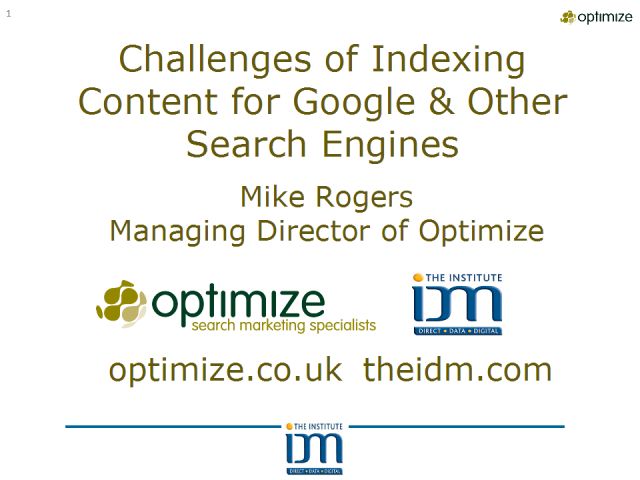 Mike Rogers M IDM, IDM Trainer and MD of Optimize, a specialist search engine marketing agency which which provides independent search engine marketing services, consultancy and training to clients in the UK and overseas. Services include search engine optimisation, pay per click search advertising, web and search analytics, conversion optimisation and other SEM related services. Clients include the BBC, Dyson, Kodak, Monster.co.uk, Nationwide, Parcelforce, the Royal Mail, Toshiba, Yell.com and many other small and medium sized businesses.